Lawn tractors require proper maintenance. One item that tends to be neglected is maintenance of the mower deck. Along with greasing, belt replacement and blade sharpening, a mower deck requires regular leveling to keep the deck balanced. Leveling the mower deck keeps cut grass even, prevents damaging the lawn and increases grass density. 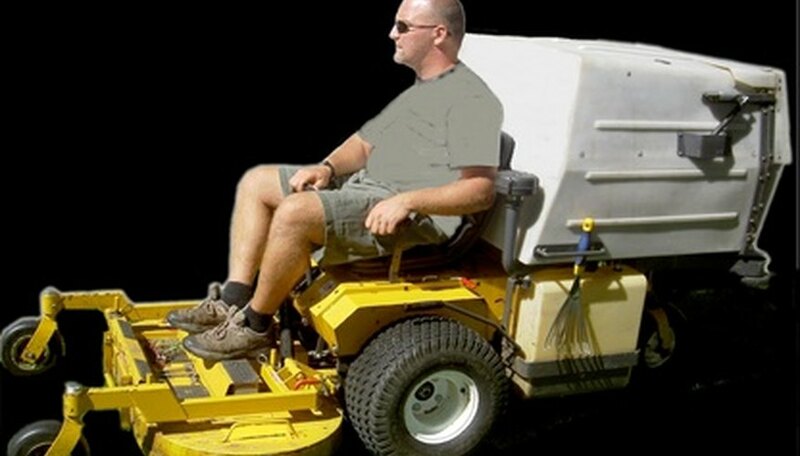 Roll the mower onto a level, paved surface and engage the parking brake. Disconnect the spark plug wire from the spark plug to prevent the mower from starting while working on the machine. Remove the keys from the mower and raise the mower deck to the highest level. Fill the mower tires until they are at the correct pressure as indicated on the tire wall. Tires require the same pressure to get the most accurate results. Turn the blades on the mower deck so that they are facing from left to right, on both sides of the tractor. Measure from the edge of the blade to the pavement on each side of the mower and write the measurements down on a piece of paper. Subtract the measurements together from each side of the tractor to get the difference between the two. A side-to -side adjustment is needed if the difference is greater than 1/8 inch. Adjust the side-to-side difference of the tractor by turning the lift link lock nut, which is located in front of the back tire on each side. One full turn of the nut adjusts the height of the deck about 3/16 inch on the side it is adjusted. Turn until the deck is even, taking another measurement to make sure. Turn the blades so that they face front to back and measure from the tip of the blade to the ground at the front and the back of the mower deck. Subtract the two measurements for the difference. If the front tip of the mower deck is 1/8 inch to 1/2 inch lower than the rear blade tip, no adjustment is necessary. Loosen the jam nut at the front of the mower deck, located in the center, using a wrench until the nut behind it is exposed. Turn the nut to adjust the height of the mower deck. Turn counterclockwise to lower the front of the deck or clockwise to raise it. Measure the blade after adjustment and tighten the jam nut when the height is correct.